Within 250 miles of St. Paul, MN. This clinic is all about getting out in front of the competition before you even take your first stroke! Two-time Olympian Cammile Adams will teach participants how to fuel for maximum performance as well as how to blast off the block, whip through the underwater dolphin kick, and explode into the breakout! 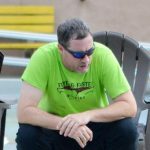 There will also be a special parents’ session with Cammile’s dad, Eddie Adams about being the best swim parent you can be! The details of a fast start, underwater dolphin kick, and breakout can take decades to perfect. Two-time Olympian Cammile Adams has learned tricks and tips to help accelerate the learning process for swimmers of all ages and abilities to be able to improve on this essential skill. Get in the water faster and breakout ahead of the competition by attending this clinic. Starts: Cammile will work with the participants at this clinic to set up on the block in a position that will allow them to explode forward. Learn how to use your arms, explode through your legs, and engage your core for a fast, streamlined and fast start. Participants will learn drills and exercises to help understand the key components of a good dive and to be able to practice in the future. Underwater Dolphin Kicking: The fastest swimmers in the world dolphin kick off of their walls and breakout ahead of the competition. It's not as hard as you think. Figure out how much knee bend is right for you and how to get more out of every kick. Cammile will help swimmers improve their technique as well as commit to a number of kicks off of every wall so that they can imporve their underwaters now as well as in the future. Breakouts: Learn how to carry momentum from the underwater dolphin kicks into the breakout by timing the first stroke and staying streamlined. Your swimmer will practice keeping their head down in their free, back, and fly as they approach the surface and it'll make a big difference in their breakout! Nutrition: Fueling your body for maximum performance is one of the most important aspects to training harder and racing faster! Learn from Cammile about which foods can help give a swimmer more energy at meets and practices as well as when to fuel your body so that it is most effective! Handling Expectations: Kids progress at different rates. Some swimmers achieve a high level of success at a very early age while others don't develop until later on. How do you handle not only your own expectations, but also your swimmer's expectations about where they should be throughout their year to maximize results and fulfillment in the sport. The Coach/Parent Dynamic: The coach and parent role in a swimmer's career is a support system to ensure that the swimmer feels set up to be successful. How much should each party be involved in different areas to lift up the swimmer? Eddie will go over the different dynamics and how you can do your best to do your part in supporting your swimmer. Q&A: Ask the father of a two-time Olympian anything about how he was able to help in the path to success for both Cammile and her (also fast) twin sister Ashley. Relate to his story and find new ways to give your swimmer the best chance at success. Swimmers and parents are invited to ask Cammile questions during a Q&A session. Gain insight into her training regimen, diet and nutrition, and recovery tactics. Observe Cammile demonstrate a progression of perfectly executed drills to achieve powerful, efficient and fast technique. These drills will be great tools so that you can continuously improve your technique. Watch one of the best swimmers in the world swim at top speed - achieved by practicing the same drills they will teach you. Then, have the opportunity to swim ALL OUT and put your newly developed skills to the test of fatigue! Take a photo while wearing Cammile's medals, get autographs, and receive a gift from our sponsors!